Image Size: 29"w x 19"h.
Similar to Liang’s Masterwork™ Canvas, "Solitary Hunter," (Sold Out at Publisher) and "Woodland Warrior" (limited availability), this is a portrait of a man at one with his world, part of the cycle of hunting, eating and utilizing every part of the animal for clothing, shelter, decoration and display of honor and bravery. This ability to survive in a wild environment is part of what has intrigued Z.S. Liang for decades. His rural Chinese upbringing was centered on ancient and traditional lifestyles that made it easy for him to relate to the Native American. No resources were wasted in his childhood home, either. 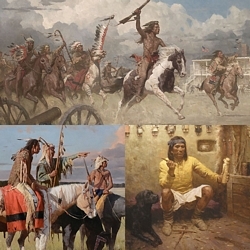 Liang is a regular participant in the Masters of the American West Exhibition and Sale at the Autry National Center. He set a new auction record at the 2009 Coeur d’Alene Art Auction for "The Painted Robe," another fine art edition available from The Greenwich Workshop, Inc. in giclée canvas as both a MuseumEdition™ Canvas and Masterwork™ Canvas.